Well…I did it. I finally did it! After buying 3 heads of cauliflower (that ended up sitting in my fridge until they grew mold) the 4th one was a charm!!! 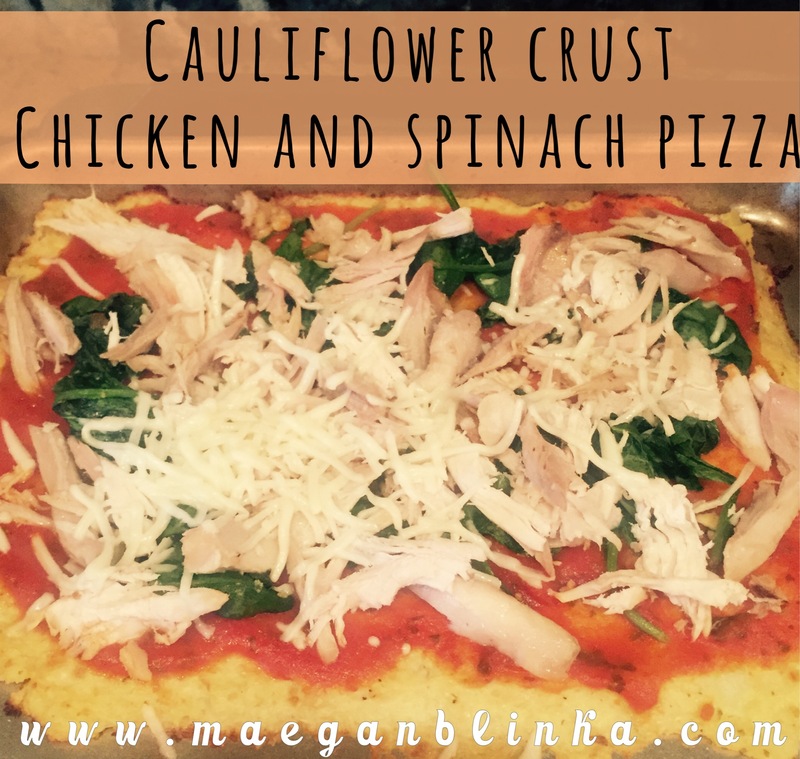 I braved the ever intimidating cauliflower crust pizza and while it was a bit time consuming at first I have to say – it was a family hit!!! I love that it is gluten free and while a bit too many blues for my usual 21-day fix approved daily nutrition plan – it was a hit and will be back in the rotation for sure!!! Pizza sauce and toppings of your choice! 1. 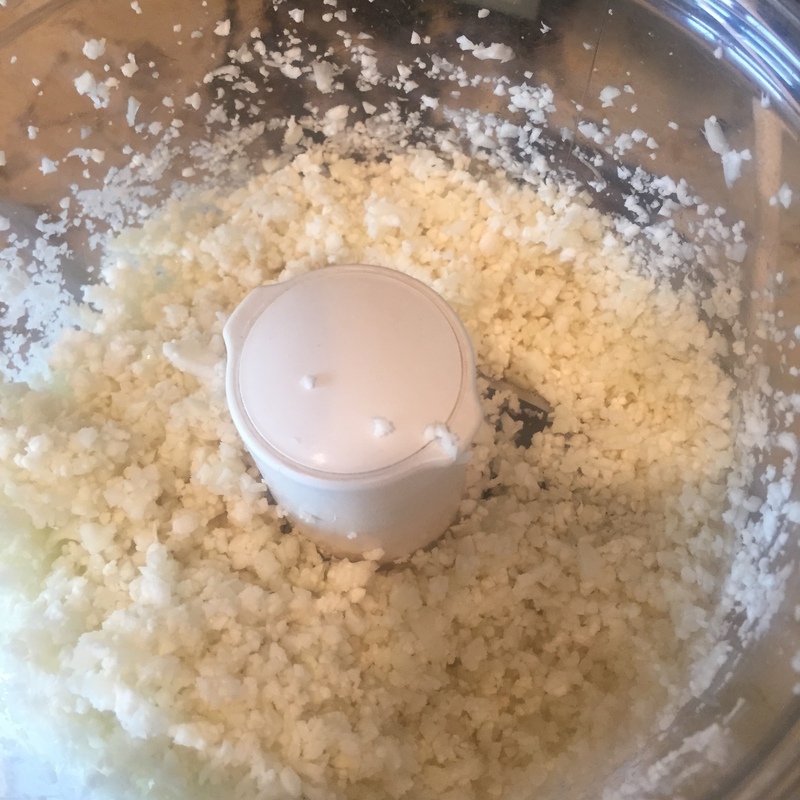 To rice the cauliflower, cut into florets then smaller chunks and pulse in a food processor until you see rice-like bits. Do not over process, you don’t want it to be mushy!!! 2. Microwave the riced cauliflower in a microwave-safe bowl for about 6 minutes (keep in mind all microwaves vary!!!) 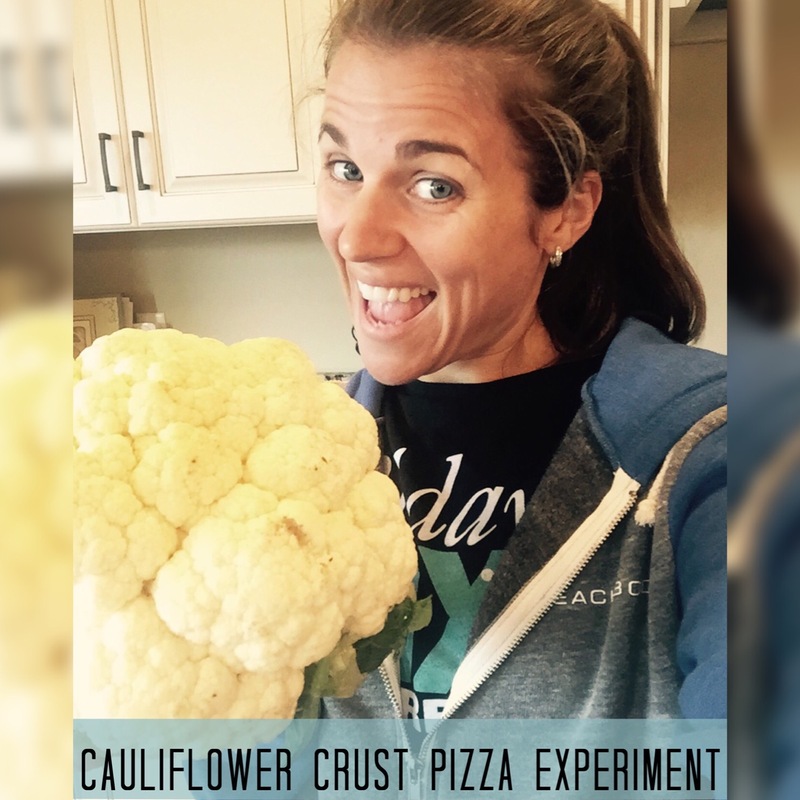 There is no need to add water – the cauliflower is all you need! After microwaving, move the cooked – riced cauliflower into a mesh strainer or cheese cloth and drain completely, pressing out excess water. Once drained, transfer to a clean dish towel or stack of paper towels and continue pressing out any excess water. This key is step – if you do not get the water out your crust will not be crispy! 4. In a medium bowl, combine 1 cup riced, cooked cauliflower, 1 egg, beaten and your parmesan cheese. Next, add seasonings and crushed garlic. Make sure everything is well mixed – I prefer using my hands!!! 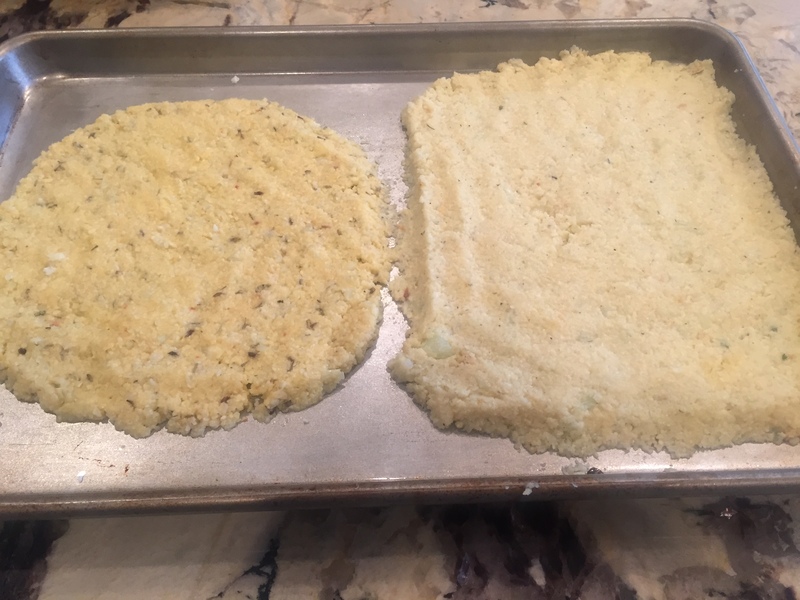 Place the dough mixture on the cookie sheet and pat out 8-9” round or square pizza crust. 5. Bake your dough at 450 degrees for 12-15 minutes. 6. Remove from oven. Add sauce, mozzarella cheese, and your favorite (pre-cooked) toppings to your pizza. We did one pizza with just cheese and sauce for the kiddos and one with chicken and sautéed spinach on the other. Place pizza under broiler for about 2-3 minutes, or just until cheese is melted. If you have any other tweaks, ideas or great topping combos please share away!! I like to keep my family recipes as CLEAN yet flavorful – as possible! 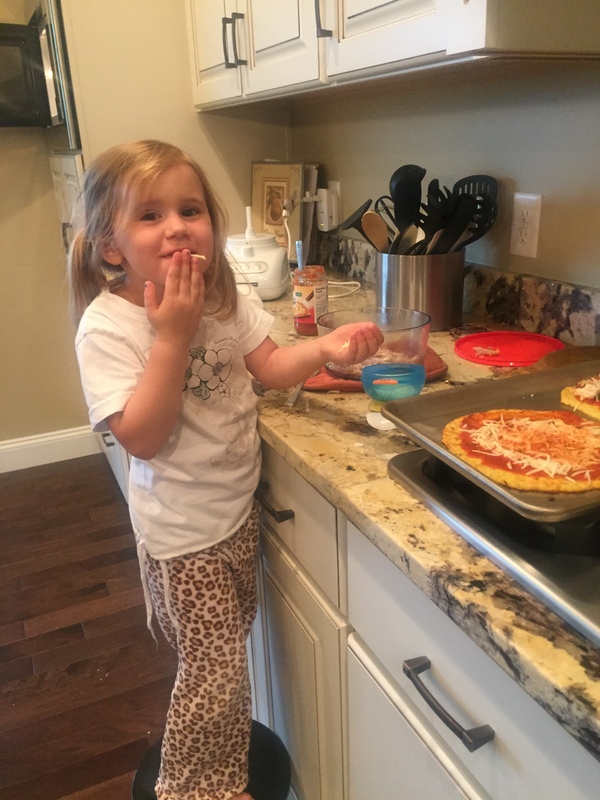 We limit gluten but LOVE pizza so this was a big hit!!! Whether you’re new to clean eating or a seasoned pro – if you’re interested in more information fill out the form below to join one of my upcoming health and fitness accountability groups! Its a place to share nutrition ideas, recipes, motivation, tips and help one another work towards those health & fitness goals! Together we can end the trend of obesity!